It is normal and inevitable that you will gain weight when you are pregnant. If you are a healthy weight prior to pregnancy, then you should not purposely try to lose weight while pregnant. Ideally, you should wait until after you deliver your baby to shed those extra pounds. A woman may experience morning sickness during pregnancy, especially in the first trimester. This is due to an increase of hormones in your body. Common symptoms include nausea, vomiting, and fatigue. Morning sickness can actually happen at any time of day or night, and some women experience it throughout their pregnancy. For many women, this is their first symptom of pregnancy. Some women manage their symptoms by snacking throughout the day, eating crackers, sipping ginger ale or taking anti-nausea, over-the-counter medication recommended by their doctor. You may experience a loss of appetite at any time during the pregnancy which is most commonly associated with nausea. Even the smells of certain foods can make you queasy and prevent you from feeling hungry and also, as your uterus grows, it displaces the surrounding organs including the stomach, so when you eat, you will feel fuller faster. This can lead to indigestion issues and heartburn. Constipation and bloating from intestinal gas may also make you feel full. If this happens, it is best to drink plenty of water and eat small, healthy meals. You may find you lose weight by simply changing your diet. 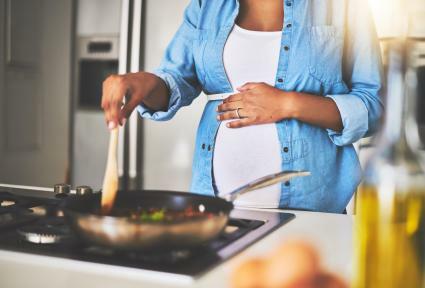 Once pregnancy has been confirmed, some women opt for healthier food choices. This in itself may result in losing a few pounds. Hyperemesis gravidarum is severe and extreme morning sickness. It is characterized by intense nausea, vomiting, weight loss of up to 5% of your body weight, dehydration and a possible electrolyte and nutrient imbalance. This can occur at any time during the pregnancy. Mild cases are treated with changes to diet, rest and antacids. More severe cases may require a hospital stay so you can receive intravenous (IV) fluids and nutrients. There is an increased risk for developing gallstones or having other gallbladder issues when you're pregnant. This is due to elevated estrogen levels. Rapid weight gain and weight loss can also increase the risk. Symptoms include pain in the right upper abdomen area that can extend to your right shoulder and back. You also may experience the inability to eat due to nausea and vomiting from the gallstones which can lead to weight loss for you and low birth weight for your baby. Gallstones are most commonly treated by surgical removal of the gallbladder after the baby's born. However, if your symptoms are quite severe, the doctor may choose to remove the gallbladder while you are pregnant. Hypothyroidism and hyperthyroidism are thyroid diseases that are relatively common during pregnancy. However, it is important that they are treated. During the first three months of pregnancy, thyroid hormones are essential to the healthy development of your baby's brain and nervous system. One of the symptoms of hyperthyroidism, in particular, can include such severe nausea and vomiting that you may experience weight loss or limited weight gain during the pregnancy. Treatment includes being prescribed an anti-thyroid medication. The nausea or vomiting is so severe that you are unable to even keep liquids down. Your urine is dark in color or you're not urinating much at all. These are signs of dehydration. You feel lightheaded or dizzy when you stand up. 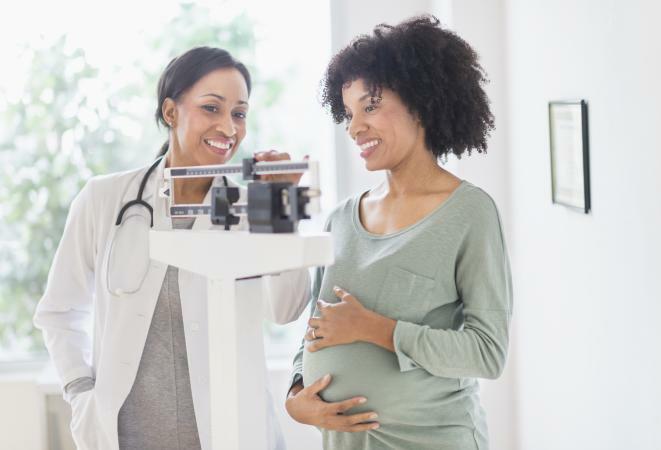 While it is recommended that you limit your weight gain during pregnancy if you are overweight or obese, it is not advisable to actively try to lose weight while pregnant. You should never intentionally restrict your calorie intake. This could be detrimental to you and your developing baby. However, in the first trimester, it is common to experience some weight loss due to morning sickness. Be reassured that this will not affect the baby adversely. Your baby will still receive the necessary calories and nourishment. Women who are overweight have an extra reserve of calories in stored fat, so it is not harmful to your developing baby to maintain or even lose a little weight early in the pregnancy. A few guidelines you should follow while exercising when pregnant include, drinking plenty of water to stay hydrated, wearing a sports bra for support, wearing a belly support later in the pregnancy, avoid lying flat on your back for long periods of time and avoid becoming overheated or exhausted. Regardless of your weight, the most important thing you can do during your pregnancy is to eat healthily and exercise. This alone will increase your chances of having a healthy baby.